A grand jury has indicted more than 100 Inauguration Day protesters on rioting charges in Washington, D.C. In total, 209 people have now been indicted. 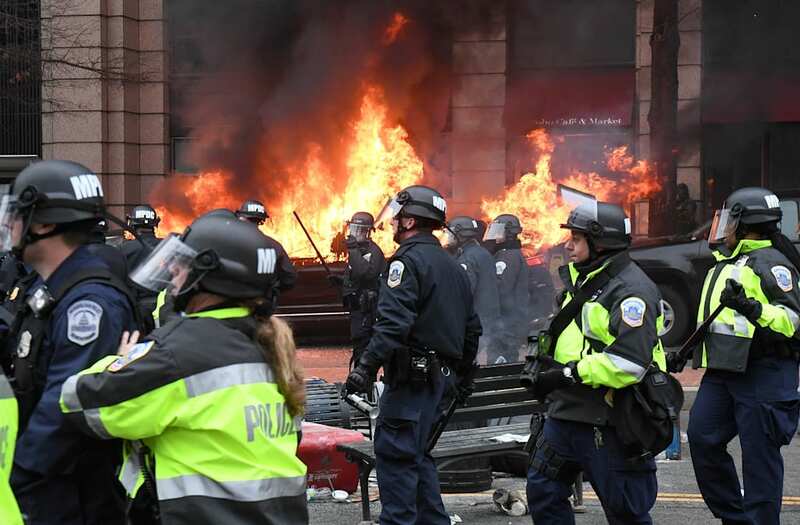 The indictment, handed up D.C. Superior Court on Wednesday, charged 146 additional protesters with felony rioting — meaning they face a fine of up to $25,000 and a maximum of 10 years in prison. On Inauguration Day — Jan. 20 — 230 people were arrested and charged with felony rioting. Twelve cases have been dismissed. A limousine burns after being smashed by anti-Trump protesters on K Street on January 20, 2017 in Washington, DC. While protests were mostly peaceful, some turned violent. President-elect Donald Trump was sworn-in as the 45th U.S. President today. Protesters block a street after the inauguration of US President Donald Trump on January 20, 2017, in Washington, DC. Protesters clash with police after the inauguration of US President Donald Trump on January 20, 2017 in Washington, DC. A woman helps a protester after he was sprayed with pepper spray during protest near the inauguration of President-elect Donald Trump in Washington, DC, U.S., January 20, 2017. Michael Moore speaks to protesters at McPherson Square Park following the inauguration of Donald Trump on January 20, 2017 in Washington, DC. Today Trump became the 45th president of the United States. Protesters clash with police during the inauguration of US President Donald Trump on January 20, 2017 in Washington, DC. A man protests the Presidential Inauguration of Donald Trump on January 20, 2017 in Washington, DC. A police officer tries to tackle a protester demonstrating against U.S. President Donald Trump on the sidelines of the inauguration in Washington, DC, U.S., January 20, 2017. An activist stands amid smoke from a stun grenade while protesting against U.S. President Donald Trump on the sidelines of the inauguration in Washington, D.C. January 20, 2017. Protesters chain themselves to each other and block an entry point prior at the inauguration of U.S. President-elect Donald Trump in Washington, DC, U.S., January 20, 2017. Firefighters extinguish a car that was set on fire during protests near the inauguration of President Donald Trump in Washington, DC, U.S., January 20, 2017. Protesters demonstrating against U.S. President Donald Trump raise their hands as they are surrounded by police on the sidelines of the inauguration in Washington, DC, U.S., January 20, 2017. Protesters clash with police while demonstrating against U.S. President Donald Trump on the sidelines of the inauguration in Washington, DC, U.S., January 20, 2017. A protestor dressed as Uncle Sam attends Donald Trump's Inauguration ceremony on January 20, 2017 in Washington, DC. Police run as they confront protesters during the inauguration of US President Donald Trump on January 20, 2017 in Washington, DC. Protesters are surrounded by police during a protest near the inauguration of President-elect Donald Trump in Washington, DC, U.S., January 20, 2017. A protester is assisted by police after being injured during protests near the inauguration of President-elect Donald Trump in Washington, DC, U.S., January 20, 2017. Protesters chain themselves to an entry point prior at the inauguration of U.S. President-elect Donald Trump in Washington, DC, U.S., January 20, 2017. Demonstrators protest following the inauguration of Donald Trump on January 20, 2017 in Washington, DC. Today Trump became the 45th president of the United States. An anti-Trump protester screams after being hit by a paintball gun fired by Police during clashes in Washington, DC, on January 20, 2107. Masked, black-clad protesters carrying anarchist flags smashed windows and scuffled with riot police Friday in downtown Washington, blocks away from the route of the parade in honor of newly sworn-in President Donald Trump. Washington police arrested more than 90 people over acts of vandalism committed on the fringe of peaceful citywide demonstrations being held against Trump's inauguration. Police and demonstrators clash in downtown Washington after a limo was set on fire following the inauguration of President Donald Trump on January 20, 2017 in Washington, DC. Washington and the entire world have watched the transfer of the United States presidency from Barack Obama to Donald Trump, the 45th president. Police stop protesters from passing through following the inauguration of Donald Trump on January 20, 2017 in Washington, DC. Today Trump became the 45th president of the United States. A man looks through a smashed car window during a protest against the inauguration of US President Donald Trump on January 20, 2017 in Washington, DC. Demonstrators set fires as they confront police in protest against the inauguration of US President Donald Trump on January 20, 2017 in Washington, DC. Protesters attend Donald Trump's Inauguration ceremony on January 20, 2017 in Washington, DC. A man holds a sign in front of riot police during a protest against U.S. President Donald Trump on the sidelines of the inauguration in Washington, D.C. January 20, 2017. Local, state and federal law enforcement agencies provided 3,000 officers and were supported by 5,000 National Guard members and police officers in patrolling the streets during President Donald Trump's inauguration ceremony. Nevertheless, protesters clashed with cops in various locations throughout the day. The final confrontation led to the arrests of more than 200 people near Franklin Square, about a mile and a half from Capitol Hill. As a result, four businesses were vandalized and sustained "significant damage," demonstrators lighted a limousine on fire, and six police office suffered minor injuries after protesters set fires and threw rocks, bricks, trash cans and other small objects, according to Acting Police Chief Peter Newsham. In response, Newsham confirmed, law enforcement officers used flash-bangs and pepper spray to suppress the crowds. The U.S. attorney's office is continuing to investigate.